DOVER, Del. 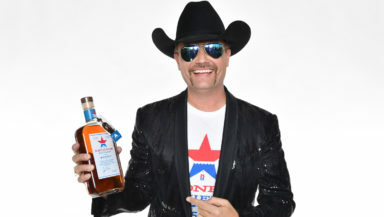 (March 20, 2019) – John Rich, one half of the superstar country music duo Big & Rich, will sing the national anthem prior to the Monster Energy NASCAR Cup Series race at Dover International Speedway on Sunday, May 5, part of the Monster Mile’s 50th Anniversary celebration, track officials announced today. • Saturday, May 4 – Free fan event following the NASCAR Xfinity Series Dash 4 Cash race. • Sunday, May 5 – Appearance during the free Charlie Daniels Band concert before the Monster Energy NASCAR Cup Series race. Rich’s lifestyle brand, Redneck Riviera, is serving as the presenting sponsor of special fan access area The Hangout throughout the May 3-5 NASCAR tripleheader weekend. Redneck Riviera whiskey, which will be distributed across Delaware in the next several weeks, will be the key ingredient in the special Hangout drink “Saddle Up.” Rich contributes a portion of the proceeds from all Redneck Riviera whiskey sales to Folds of Honor, an organization whose mission is to provide educational and scholarship support to spouses and children of America’s fallen and disabled service members. Rich’s appearances are just part of Dover’s planned celebrations during the May 3-5 NASCAR tripleheader weekend. In addition to the special gold Monster trophies given to the race winners and free 1:64-scale Dover diecast cars to the first 15,000 guests on May 5, fans can also enjoy multiple free performances by the famous Harlem Globetrotters in the 8-acre FanZone, as well as Micro Wrestling Federation matches, Del Rods Car Club car shows, a Winston Cup Mobile Museum display, on-site NASCAR and sports betting and much more. The May 3-5 NASCAR tripleheader weekend also includes the “JEGS 200” NASCAR Gander Outdoors Truck Series race on May 3. The Monster Mile’s Oct. 4-6 NASCAR tripleheader weekend features the NASCAR K&N Pro Series East race on Friday, Oct. 4, the NASCAR Xfinity Series playoff race on Saturday, Oct. 5 and the Monster Energy NASCAR Cup Series playoff race on Sunday, Oct. 6. The Oct. 6, 2019 Monster Energy NASCAR Cup Series playoff race will be the 100th NASCAR Cup Series race in track history. Dover International Speedway will be the 10th track in the nation to host 100 NASCAR Cup Series races. Keep up to date on all 50th Anniversary announcements and schedules by visiting DoverSpeedway.com or calling (800) 441-RACE. You can also keep up with all track activities at Facebook.com/DoverInternationalSpeedway, or on Twitter and Instagram at @MonsterMile. Dover Motorsports, Inc. (NYSE: DVD) is a leading promoter of NASCAR sanctioned motorsports events whose subsidiaries own and operate Dover International Speedway in Dover, Del. and Nashville Superspeedway near Nashville, Tenn. The company also hosts the Firefly Music Festival, produced by AEG Presents. For more information, visit www.DoverMotorsports.com.